If you want a vision of the future, imagine a boot stamping on a human face—forever. Are we still scared of 1984? Orwell's famous dystopian novel had the fortune to be acclaimed by two usually opposed groups—the right wing and the left wing in the West. The former saw it as a denunciation of collectivism in all its forms while the latter (liberals, social democrats, anarchists, Trotskyites, New Leftists) hailed it as a warning against Stalinism, or Soviet-style centralism. How did Orwell mean it? We have his own comments that the novel was not anti-socialist but against all twentieth-century ideologies tending toward authoritarianism. This view is borne out by the observation in the book by the torturer O'Brien that the rulers of the three rival political groupings in the world have all adopted the same measures of complete control over their citizens. Having recently re-read it, I find the book rather confusing. Dare I say irrelevant? This is not due, as you might guess, to us having passed the year 1984 without such a society arising. Nineteen Eighty-Four was not supposed to be a prediction of the future. Orwell apparently once thought of calling the book Nineteen Forty-Eight since he was basing it on trends he was noticing in the year when he was writing the book. And in Nineteen Eighty-Four, the fictional government has succeeded in re-writing history so thoroughly that the main character is not sure what year it actually is. It could be 2084. No, the doubt experienced in reading Nineteen Eighty-Four is due to the implausibility of the dystopia coming about in the way Orwell describes it. I no longer believe such heavy-handed propagandizing by any government could have this long-term and perfectly uniform effect in a society. To think you could brainwash an entire human population so completely with sloganeering and threats of torture—and with hardly a single misstep—seems naive now. I know I'm going to get emails pointing out current or recent examples of totalitarian control in the world, but I'll answer that people also have a long history of overthrowing such regimes. The motivations in Nineteen Eighty-Four seem rather stretched to anyone with a sophisticated political understanding. The rulers rule for no reason apart from the fact they like to rule, although they don't seem to benefit from this in any way. The masses of "proles" who make up the bulk of the population have no concerns but their cretinous pleasures, and they are quite happy to let the government have its way with them. I know various pundits will argue this is the state of much of the world today—but they are exaggerating, as pundits do. There are threads of this in our world and in some places at some times the threads are stronger. But it's never so thoroughly—utterly successfully—imposed as it is in Nineteen Eighty-Four. Sorry, but sometime before or since 1984 came and went I stopped fearing this. Perhaps I've read too many other science-fiction visions of the future in the decades since Nineteen Eighty-Four was published or perhaps I've seen too much modern history to buy into this vision as anything but simplistic. Aldous Huxley's Brave New World, published fourteen years earlier, seems a more savvy prediction of a future in which a superficially comfortable populace is controlled by drugs, media and complacent hedonism. It's certainly closer to what I see around me today. The plot of this novel I also find rather simple today. It consists of the protagonist privately questioning what he is supposed to think, breaking the rules on sexuality, trying to join a rebellious underground, getting caught and being tortured. Much of the text is given over to explicating the history and philosophy of the society. Some of this may have had greater impact some years ago when it was first presented. The downer ending may have been shocking at one time, but now it seems truncated. Again I may have been exposed in novels, films and television shows to too many such stories to be greatly disturbed by this tale any longer. 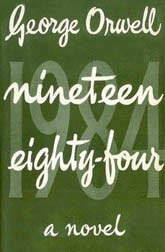 I know Nineteen Eighty-Four will remain in the classic category for many years to come. We've adopted too many ideas and phrases from this novel for it to disappear from public consciousness for quite a while. However, I wouldn't be surprised if it eventually becomes a curiosity, a marker of a bygone era, rather than a novel that people read for enjoyment or enlightenment. I might just mention that almost everyone on sites around the Internet disagrees with me, calling Nineteen Eighty-Four a timeless masterpiece, prophetic, more relevant today than ever, and so on. Of course, they are wrong and when I come to power I will make them see that.